There are many different reasons why auto accidents may occur. Sometimes they are the result of motorists themselves, while other times they are the result of incidents that are beyond the control of motorists. Whatever the case may be, if another party's negligence caused your auto accident, it's important to contact lawyers to discuss your options. Working with a personal injury attorney means getting sound legal advice and counsel that can help you receive just compensation for injuries sustained and damage to goods and property. 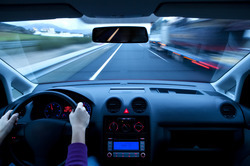 One of the most obvious causes of auto accidents involves motorists violating the speed limit. We'd like to consider these kinds of auto accidents right now and what these sorts of negligent actions mean to people on the road. Speed limits are in place to help regulate the flow of traffic and to make sure that all motorists and people who share the road or are adjacent to the road are safe. In general, a speed limit allows motorists to change lanes and merge with relative ease and without putting others in danger. When a motorist seriously violates the speed limit, it can have a major impact on the safety of the road. Tailgating is more likely with these kinds of incidents, which puts other motorists at risk of being rear-ended. If a speeder weaves in and around other cars, this can cause motorists who are otherwise safe to swerve and strike other vehicles in the process. A speeding driver is ultimately a major hazard to other drivers and passengers, which is why such actions are considered reckless and negligent. In addition to endangering other motorists, speeders also place pedestrians and bicyclists at great risk. Bicyclists share the road, and pedestrians have the right of right of way when they are observing proper traffic laws. Speeders are more likely to strike pedestrians and bicyclists, or, to be more accurate, will be less likely to avoid bicyclists and pedestrians given the excessive speed. Because of this, they truly are dangerous to everyone on the road. In order to protect yourself from speeding motorists, drivers are advised to give the speeder room, allow speeding cars to pass, and to not try to race or antagonize speeders as this may simply egg them on. As a bicyclist or a pedestrian, the best method of protection from dangerous motorists is to exercise general caution, observe traffic laws, and to be attentive of your surroundings, especially when on or approaching busy roadways. A Northern California car accident attorney will hold irresponsible motorists responsible for their actions, which includes speeders and reckless drivers of all kinds. During the litigation process, your attorneys will make sure to hold the driver accountable for his or her actions, and will be sure to seek compensation to cover damage to vehicles, medical bills or injuries, and, in the worst cases, the tragic loss of life. If you would like more information about auto accident litigation and what your legal rights are in such cases, be sure to contact our personal injury lawyers in Sacramento, Roseville, and Redding today. Our entire team looks forward to meeting you in person and helping you make the best choices with regard to your legal options.